1.Heat oil in a frying pan and sauté onion and chillies.Fry till the onion is transparent.Add the ginger and garlic paste. 2.Roast till the raw smell disappears.Add the chopped tomotoes and cook for 3 minutes till they are soft. 3.Add the dry masala powders and salt. 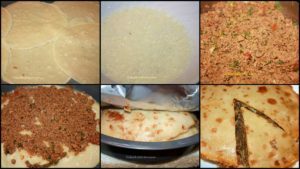 4.Add the ground beef and cook well. 5.When the beef is almost done,add the coriander leaves.Keep aside. 1.Make a thin batter with the flour,egg, water and salt. 2.Heat a frying pan and pour in a scoop of batter (or the size you want to prepare in the baking dish) and swirl the pan to form a thin pancake. 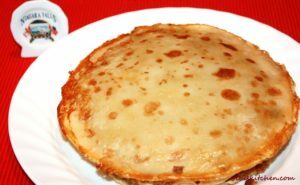 3.When one side of the pancake is cooked, flip and cook the other side.Transfer the pancake to a tray. Repeat the same process with rest of the batter. 1.In a bowl whisk together egg,milk,cardamom powder and salt until well combined. 1. Preheat the oven to 350°F. Grease a round cake pan(8-inch)with 2 teaspoons of ghee or oil. 2. Now start assembling the layers of the athishaya pathiri. 3. Grab a pancake and soak it in dipping mixture for few seconds and put the first layer of ottada or pancake at the bottom of the pan. 4. 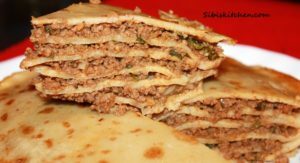 Spread a generous amount of “Erachi Pandam” over the first pancake and then cover it with another soaked ottada, then meat filling. 5. Repeat the process till how many layers you want.The final layer must be the ottada or pancake. 6. Pour the remaining dipping mixture over the whole assembly of pancakes. 7. Close the pan with aluminium foil and bake in a 350°F oven for about 35-40 minutes till the sides have turned crispy & golden brown.Remove from the oven and keep aside for a few minutes till cool to handle. 8. Turn the upside down of the athishaya pathiri onto a serving plate. Serve hot either as a starter or as a main course. Notes: This is a six layered athishaya pathiri.You can use whole wheat flour instead of all purpose flour or half amount of each.You can replace regular milk with coconut milk for richer taste.